Panna cotta has become a very popular dessert on our shores these last few years, and for good reason. It's a luscious, totally Italian custard, no eggs, just cream and flavorings. This is good served alone or with the slightest dusting of finely ground cocoa nibs or shaved chocolate. Panna cotta is usually vanilla—this one is for chocolate lovers. Coat four 5-oz. ramekins or 6-oz. custard cups lightly with flavorless oil. Pour 1/4 cup of the cream into a small heatproof bowl, sprinkle the gelatin over it and let stand until softened, about 10 minutes. Place the bowl in a larger bowl of hot water and stir until the gelatin has dissolved. Meanwhile, in a saucepan over medium heat, bring the remaining 1 1/4 cups cream, the mascarpone, sugar and salt just to a boil. Remove the pan from the heat, add the chocolate and whisk until smooth. Add the gelatin mixture to the chocolate mixture and stir until well blended. Pour through a fine strainer into a 4-cup glass measuring cup or a bowl with a pour spout. Divide the mixture evenly among the ramekins and let cool to room temperature. To serve, dip the ramekins one at a time into a bowl of hot water for about 5 seconds, then run a table knife around the edges of the custard and invert onto a chilled serving plate. Source: Recipe adapted from Luscious Chocolate Desserts, by Lori Longbotham (Chronicle Books, 2004). Used this recipe at school and it came out great! Its very smooth and delicious. 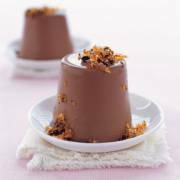 Very fine recipe for Chocolate Panna Cotta.